Making a House a Home: A special one year anniversary GIVEAWAY!!! Wooohoooo!!! I am officially celebrating my one year anniversary of being Diet Coke free!!!!! Some of y'all may remember my post last year with a photo of my very last Diet Coke. Boy, it was HARD to share about giving it up. Once you put it on a blog, gosh, MAJOR accountability sets in, doesn't it? :) But here I am, one year later, and no Diet Coke has been consumed since then!!! PRAISE THE LORD!!! I know the Lord helped me stop drinking it- do you know that I did not have ONE craving for it? Not even a headache, either!! Y'all know I have to celebrate with y'all, right? And since I can't very easily have all of you over for a big piece of cake (oooh, that WOULD be fun, wouldn't it?? ), I would LOVE to have a giveaway!!!!! To celebrate my one year of being Diet Coke free, I (along with Adagio) want to giveaway the graviTEA Water Filtration with 6 filters. Y'all be sure and check it out! Not only is this great for tea drinkers to have better tasting tea, it is perfect for ANYONE that drinks water and is concerned about filtering it!! 1) You can enter ONCE by leaving a comment here on my blog. 2) You can enter TWO MORE TIMES by sharing about this giveaway on YOUR blog. The contest starts today and runs until Friday, March 27th, at 8:00 PM EST. I will announce the winner on Saturday, March 28th. *** And don't forget--- sign up for a $5 gift certificate from Adagio Teas!!!! Check out my sidebar near the top!!!!! I would LOVE to win! That looks like a GREAT prize!! And CONGRATS being Diet Coke Free for a year!! That stuff is poison! And my fav drink is water too!!! Congrats on making it a year without a Diet Coke! congrats Mrs. U! I can't beleive you didn't even have a headache! Oh, what a nice product. I love ice cold water over soda. But am having a hard time giving it up. I'm proud of you! Wow! Has it really been a whole year already!? Time flies. Conratulations, Mrs. U!!! Please enter me! I think you picked an awesome prize. Congrats on a whole year Diet Coke free! That is big!! Wait to go! I am not a heavy Coke Zero drinker -- but I definitely need to drink more water! Yea for you!!! I am so happy for you! I LOVE water and drink it all the time!! Congrats! I wish I had your willpower. It isn't for lack of trying though. You are so much stronger than I--I have always wanted to stop! Wow, that's a great give-a-way!! and congrats on your year without!! Thanks for the great giveaway!!! I'd love to win! Happy anniversary! I could never stand diet pop - it eats a hole in my stomach! I tried to like it during my teens, but gave up - thankfully. I'm glad you could break your habit - you must have a lot more change jingling around in your purse! We are big water lovers too - and we have nasty well water, so we resorted to an R.O. system to make it taste better - and to make our tea taste right! There is nothing like a good cup of tea! Good for you! It is so hard to give some things up, and to be able to say that a year later you still are is a HUGE blessing! Congrats on 1 year without diet coke. I quit drinking it about a year ago as well. Missed it at first, but not now. 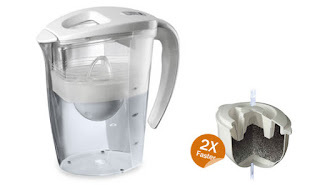 As a fellow tea and water drinker, I'd love to win this! Would love to win. Ever since they shut our water off for just a few minutes to do something on the line, it is cloudy. Real cloudy. I would love to make tea without buying water. Congratulations on being Diet Coke-free for a whole year! That's great. :-) I'm going through chemo, so I have to drink gallons of water and this system looks wonderful. Please count me in! Thanks. Congratulations! That is quite an accomplishment :). I would love to be entered to win the graviTEA! How fun! just discovered your site! it's beautiful, informative, and fun! congrats on the diet coke! YAY! Good job. I always thought diet sodas were really gross & am not a fan of soda in general so I have an easy time not drinking the stuff, but I do know that I can be really hard for some people! Oh and thank you for the giveaway, that filter sounds great! congrats on being diet coke free for a year. I have been soda or pop free for 5 years now. I love water but even more I love tea. Please enter me in your drawing. Count me in and I'll leave a post on my blog of course. Your blog is a Rich Blessing to me...I praise God that we have met!! Please count me in the "give away"... it is very nice of you to do this...Bless you!! !